By Sanchari Das, Ph. 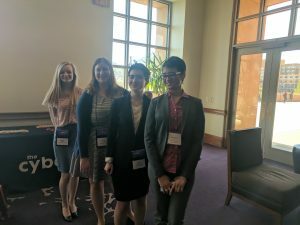 D.
Firstly, let me bring to everyone’s notice that WiCyS 2017 was a conference for women, but not just for women. Many males in the field of cybersecurity were gladly welcomed and valued for their contribution and support. Even before we got to the conference, we were introduced to the Whova mobile app. From this we learned more about both the conference and the people who joined us there. 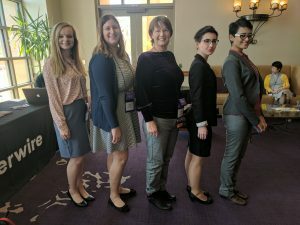 Four ladies from Indiana University Bloomington were among them, and beautiful Tucson welcomed all of us, with its beautiful landscape, cactuses and the serene JW Mariott where the conference was held. I so appreciate the organizing committee and its members who did grueling work to organize the conference in an efficient manner. From the outset of the speaker sessions, I came to notice Indiana University and Dr. L. Jean Camp’s name as proud sponsors of this conference. The conference started with such positive vibes where eminent speakers like Michelle Finneran Dennedy, Dr. Ambareen Siraj provided a few anecdotes about career challenges they face, being a woman. They talked about how they moderated their careers in ways which serve not merely them but also others who are to follow them. Afterwards there were lighter talks on innovative ideas. One which stood out was musical cryptography, as both interesting and groundbreaking. Next followed the resume session and the poster session. I read various undergraduate and graduate posters and talked to the presenters of all those interesting projects. This provided me with much valuable information on why they proceeded with their respective project, what challenges they faced and how they solved those. Next followed a talk on a typical day of a Facebook Security Team member. The anecdotes each speaker brought were so bracing in ways where women mentioned how they balanced their family with a work life; and how one can transition from an undergrad/graduate student to a working professional. The major event of the conference was the career fair. It was a huge gathering of more than forty-six companies and universities. They all came together to discuss more about their requirements from a cyber security professional. Though most of the companies were looking for full time professionals which was not lined with my current requirements, I received valuable insights on how people interact professionally. More talks by eminent scholars and professionals from companies like IBM, Intel, Palo Alto, and others were lined up for the evening. Day 1 ended with a networking session where I obtained the opportunity to talk to professionals from Microsoft, Aetna and other well-known organizations who talked about my research interests and were appreciative about my work and keen on learning more later. Saturday started with refreshing talks from eminent speakers, including Maria DeGrazia from Kroll and Jeannette M. Rosario from Aetna. Both inspired me with their personal stories and how they both do not feel being a woman is a downside, but in fact is an asset for any company; the vibrancy which one misses is added by the women in the community. The following talk by J. Radowicz from Google was particularly linked up to my work and it was great knowing how much Google thinks about the privacy and security of its consumers. We discussed Yubikeys; the project I am presently doing. We also talked about some phishing incidents and she felt my work was interesting and encouraged me to proceed with my research projects. The beautiful thing about the conference was not only the talks of the eminent scholars and professionals, but also the fact that they inspired women in general to pursue what we want. Lastly, I would thank Prof. L. Jean Camp for this wonderful and enriching experience. I would wish to join WiCyS 2017 next year which will be in Chicago and hopefully I will be able to present my work there next year.